It was part of Heathcliff. Heathcliff was popular and he had a comic book-why didn't they have a Catillac Cats one, or at least have Catillac Cat stories featured in the Heathcliff comics? No one here is a Heathcliff fan? Does anyone else here remember '80s cartoons? The only problem I had with the cartoon was that there weren't enough ethnic characters in the show-they should have had some "black" characters for instance so black audiences could relate. of car. Where did you watch them...at a race track? Heathclff was an irritating rip-off trying to be Garfield and failing. (Garfield was also irritating). They were, they were! Sadly, they were so insanely popular that they were all gathered and thrown in a giant bonfire and the remains were hurtled into space with failed cereal brands. If that hadn't been done they'd have replaced 60 Minutes om Sunday nights. Rumor has it that they landed in a galaxy far far away where George Lucas keeps a summer home. I remember watching Catillac Cats as a kid. Thank you for poining out that typo. I am wondering if Cleo started the whole furry craze? Why WOULDN'T they have a Catillac Cats comic? I remember them and the cartoon. I just don't think they were popular enough to print more than the newspaper strips. The artist may not have had time to work on a comic. Those daily strips in the paper are a hell of a deadline to the artists. The Catillac Cats never appeared in comic form- comic strips or books. They were featured in the old Heathcliff/Heathcliff and the Catillac Cats/Heathcliff Cats and Co. cartoons. 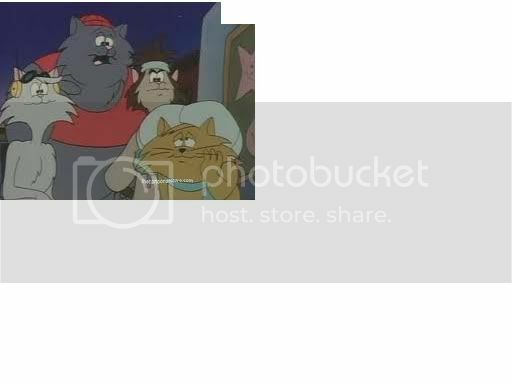 Although both Heathcliff and the Catillac Cats were set in the city of Westfinster, only Hector, Wordsworth and Mungo appeared in both segments. When the trio appeared in Heathcliff episodes, Hector was depicted as the leader of the group. Riff-Raff and Cleo never appeared in a Heathcliff episode (though Riff-Raff is present in a crowd scene cheering for Heathcliff as he fought a dog, and is mentioned a couple of times), and neither Heathcliff nor any other characters from the Heathcliff series (with the small exception of the fish store owner who did have a brief cameo in one Catillac Cats episode) ever appeared in a Catillac Cats episode. The reason is unclear, but some suspect that the McNaught company who owned Heathcliff did not want any outside characters appearing on Heathcliff. Riff-Raff and Cleo were primarily invented by Jean Chalopin and Bruno Bianchi, while Hector, Wordsworth, and Mungo were created specifically so they could appear in either series. The only time in which Heathcliff and Riff-Raff appear on-screen together is in the end credits, when Riff-Raff snatches his hat back from Heathcliff. Geo Gately, the man who created Heathcliff comics, had nothing to do with the Catillac Cats. Heathcliff and the Catillac Cats had two different owners. If they had made a Catillac Cats comic book, or at least had the Cats as a back-up feature in the Heathcliff comic books, they should have made the comics multicultural. The cartoons didn't have any blacks or people of color, or had any cats or dogs that represented people of color (they had the Siamese Twins, but they only appeared with Heathcliff). I think the show's creators only assumed white kids watched the show-that's cultural bias. but they'd be cleaned up for the show, or course. Multiculturalism, as far as I know, wasn't a big thing till the '90s. » How come they never made a Catillac Cats comic book?